My daughter was born with a lot of hair. Even when she was in utero, the ultrasound tech said, “wow that is a lot of hair!” Because of her abundant locks, we have a lot of hair clips. And by a lot, I don’t mean 10 or 15. There are a LOT. And we keep getting more and more because people will give them to us as gifts (“she has such beautiful long hair, she would look so cute in these clips”), and I will admit to succumbing a few times to buying some myself. Don’t get me wrong, I love the hair clips! But I didn’t know where to put them anymore. I had originally taped some narrow strips of cardboard to the wall to clip them onto, but then I ran out of space on the wall. So! 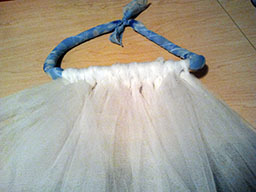 I was thinking about how handmade tutus are often done with individual pieces of tulle tied onto an elastic. Why not do a mini version of that for a girly hair clip holder that will hold a ton of hair clips? And with stuff that I just have hanging around the house? I’m certainly not a DIY expert but this I thought I could manage. 1. I took my square scarf and folded it in half so it looked like a triangle. 2. I put my pencil in the middle of the fold. 3. I rolled up the scarf around the pencil and taped the centre edge to keep it in place. 4. I started tying the tulle! 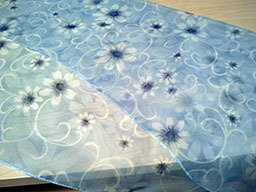 I was working with 6″ wide tulle which I cut to approximately 1m long. 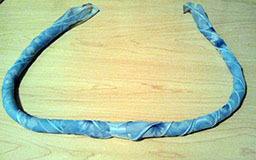 I folded it in half and tied it around the pencil, looping the ends through the center of the fold. 6. And voila! 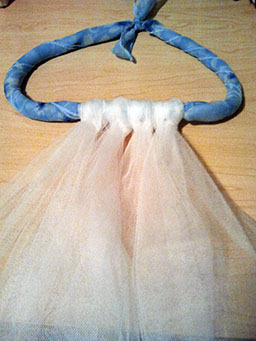 I had a nice little tutu after tying about 20 pieces on. 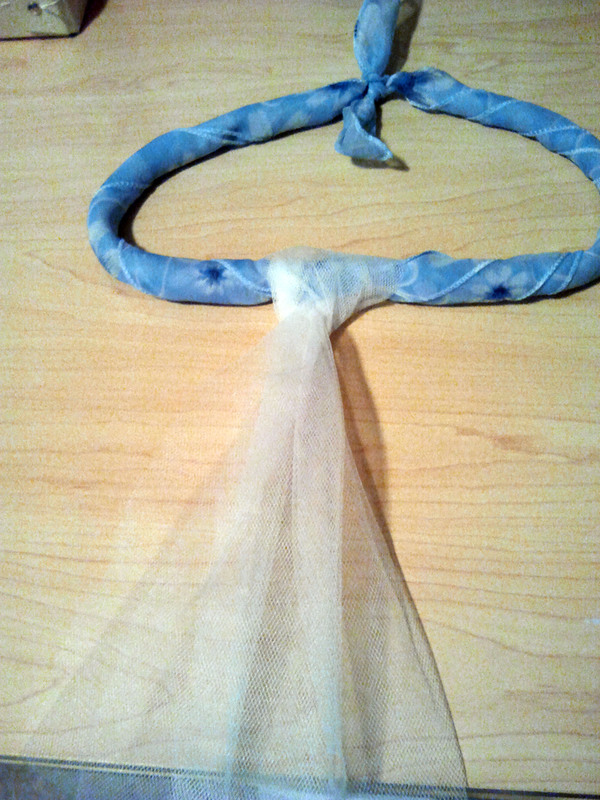 I tied the ends of the scarf together as well so I could hang it up. 7. For a little extra pizzazz (and to use up other leftover wedding decorations), I also tied a couple of wide sheer ribbon lengths I had with bead detailing in between some of the tulle. Ready to use! It’s perfect for a large number of hair clips because there are so many edges of tulle you can clip them on! 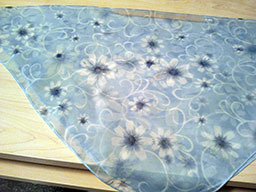 I love when you can make things from stuff you have just lying around the house! I love my completed green DIY tutu hair clip holder. And I still have a ton of room for more hair clips!! What have you made from upcycled materials?